Bloom Energy Is the Newest Fuel Cell Stock, but Is Its Technology Already Outdated? The company's financial statements seem to indicate it's too dependent on federal and state subsidies. That's risky for individual investors. Investors may be drawn to the newest publicly traded fuel cell stock, Bloom Energy (NYSE:BE), for a number of reasons. The $3.2 billion company has placed its core product, called Energy Servers, in the hands of healthy swath of Fortune 100 companies. The top line is growing at a considerable clip and, if investors squint and tilt their heads just right, there appears to be a path to profitable operations. There's just one big caveat to the whole business model: Bloom Energy wouldn't exist without federal and state subsidies. A little technical knowledge about the company's solid oxide fuel cell (SOFC) technology, coupled with a review of the financial disclosures to date, raises some eyebrows as to how the business will find a sustainable foothold in the distributed power generation industry. That's especially true with newer, future-proof technologies such as lithium-ion battery-based energy storage running down the cost curve -- and stealing the majority of state incentives. Unfortunately, Bloom Energy's technology may already be outdated. Does the value provided exceed the cost? The value proposition of Bloom Energy Servers is to provide customers flexibility that cannot be achieved through the electric grid or other technologies. The product is a shipping container-sized module of SOFC stacks, which consume low-cost natural gas to provide on-site electricity within relatively confined price ranges. That allows businesses to avoid variable demand and delivery expenses that utilities charge large industrial and commercial customers, all in a footprint that is 125 times smaller than a comparable solar-plus-storage project. Bloom Energy also provides the option to configure Energy Servers with uninterruptible power supply (UPS) capability, allowing the product to provide continuous electricity in the event of a power outage. Otherwise, regulations actually require Energy Servers to shut off during a grid outage. Today, only about 11% of the company's installed product base is configured with UPS functionality. But while Bloom Energy Servers could play at least a niche role in the emerging distributed power market, economics may keep them from expanding their market share beyond specialty applications. The company readily admits that "the electricity produced by our Energy Servers is currently not cost competitive in many geographic markets." Investors should also consider that in the second quarter of 2018, the company reported total installed system cost (TISC) of $5,600 per kilowatt of accepted products sold. The average selling price was $7,090 per kilowatt, which resulted in a gross profit of nearly $1,500 per kilowatt. However, that included a huge benefit from the investment tax credit (ITC). When the federal tax credit wasn't active in 2017, Bloom Energy had to dramatically reduce the selling price of its systems. In the second quarter of 2017, the average selling price was 22% lower, or just $5,580 per kilowatt -- lower than the most recent quarter's TISC. Furthermore, a price of $5,600 per kilowatt is roughly equivalent to the average price of distributed solar (around $2,260 per kilowatt in California, according to EnergySage Solar Marketplace) plus lithium-ion battery storage (around $2,300 per kilowatt in 2016, according to the National Renewable Energy Lab). It may not compete on footprint, but solar-plus-storage could soon offer economics that SOFCs can't touch. The falling cost of distributed clean energy and the choppiness of federal tax credits aren't the only risks. States also dish out incentives, but they're increasingly favoring lithium-ion energy storage systems, not natural gas-powered Energy Servers. For example, California -- home to 18% of Bloom Energy's orders in the first quarter of this year -- is rewriting programs to benefit batteries. In order to be eligible for the state's self-generation incentive, Energy Servers must consume 25% biogas in 2018, 50% in 2019, and 100% by 2020. Not only does that swipe away a key selling point of using low-cost and abundant natural gas, but using renewable methane is actually a huge detail for SOFCs. That's because biogas includes a higher concentration of sulfur, which can poison the materials used in a high-temperature SOFC such as the Energy Server and accelerate its degradation. The sulfur must be removed prior to being fed into the fuel cell, which results in an extra processing step and operating expense, not including the higher cost of biogas to begin with. Considering economics are already an uphill battle for Bloom Energy, the rule change isn't something that can be dismissed so easily. 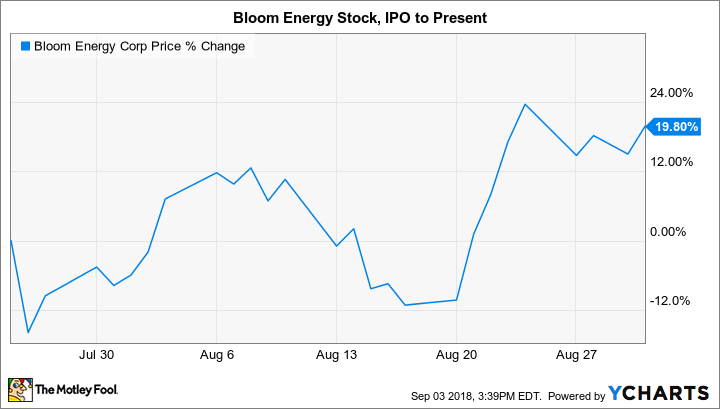 For obvious reasons, it's never a good thing when economics is the Achilles' heel of a business, but that looks like it may be the case for Bloom Energy. There are also technology risks associated with using high-temperature SOFCs, such as the requirement some states are placing on using biogas instead of low-cost and abundant fossil fuel-sourced natural gas. While the company is working hard to lower costs and increase efficiency by lowering the reaction temperature of its SOFC technology, it may not be achieved in time or deliver the cost savings needed to compete with clean energy-distributed power systems that many states are increasingly favoring. Then again, given the economics of the Energy Server, customers may soon begin to favor other technology as well. It's why I think this fuel cell stock is one to avoid for now.